I have reported this nasty Maxnote issue many times and in several threads in the past. I am really surprised that is has not been fixed for a very long time. It is still there in the latest version 5.2.5.4000 Official. 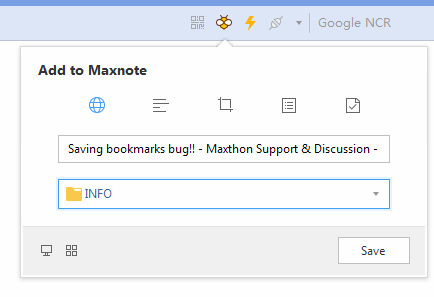 Basically, when I try to add a bookmark to Maxnote (by pressing Ctrl+D or the Maxnote icon) and click the drop-down menu to chose a location in my folders, the list becomes detached, and the save button disappears. So, I cannot use the `Add to Favorites` function. This problem happens a lot, most of the time in fact, but occasionally it works fine! I am forced to click on the Favorites star on the menu, navigate to the folder I want, and save the bookmark manually using "Add to this folder" option. 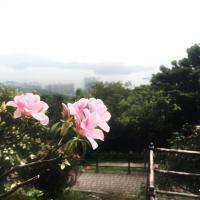 For further details and pictures, please check my last post on this, dating back to May 2018. I tried on my end but cannot reproduce... Could you describe the steps before causing this issue, or you can provide some specific URL to reproduce? This issue does not happen every single time, but it does happen frequently. Here are the steps again, hopefully in a clearer manner. - I open a website I want to bookmark. 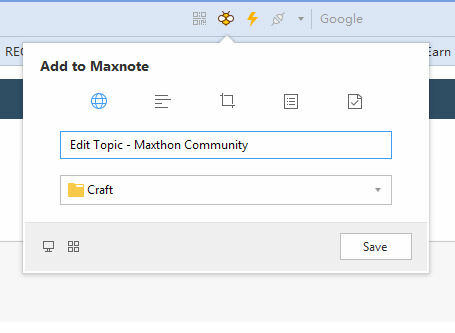 - I press Ctrl+D or press the Add to Maxnote icon on the nav bar. - I click the drop down menu to Select a folder because I want to change the save location. 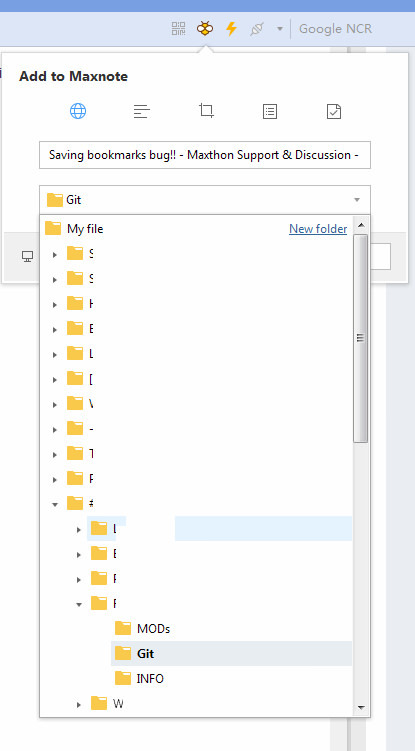 - I get the folder list but it is detached. - I try to click on any folder, but nothing happens and I cannot change the save location. - As a result, there is no save button. PS: I deleted folder names. @AtavusHello, how about the guest mode? Did it happen in the guest mode? Do you mean if I am logged in to Maxthin Passport? No, I have not logged in to that in a very long time. Cannot reproduce. Did you use the portable version? If you are convenient, we can take a time to remote via TeamViewer. Whenever you reinstall a version you should uninstall the previous version cleanly: That means "also uninstall the user data"
If you do a completely clean install save your favourites as a HTML file first and import that into your new version of Maxthon. When you do a clean install as Chantao suggests you are deleting everything - Favorites, settings and extensions and will need to redo everything. I am using the install version, not the portable one. I just have not used Passport login feature in a long time. If I tried the clean install, does that also remove my saved passwords? If yes, will logging into Passport allow me to import them after clean install? I am not worried about my Favorites since I back them up periodically.